Listeners of the show need no introduction to Rich Hickey, even if he had not already been our guest twice. 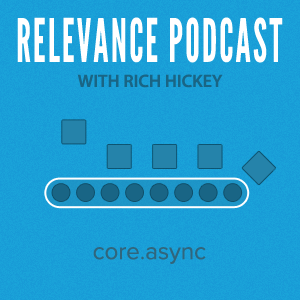 In this episode, we talk to him about his latest brain gem, the core.async library. It was an illuminating discussion, and I thank Rich for taking the time to explain the concepts to me! Rich chose "Precious Memories" by East of the Wall as the intro, and "Ghost's House" by Witchcraft to end the show. The German version of Yo Gabba Gabba! is even freakier than the American version.